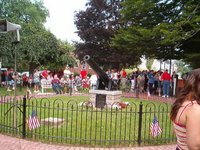 On the 4th of July the Borough of Nazareth celebrated the 100th Anniversary of the Civil War Memorial (May 30, 1906 to May 30, 2006) with a Cannon Rededication ceremony held at the Circle. The Cannon was dedicated to Company A of the 153rd Pennsylvania Volunteer Infantry Regiment comprised of local area men who served in the Civil War. A large crowd along with some media including NBC News from Philadelphia, traveled the short distance from the Borough Hall building where the Kazoo Parade ended to the Circle. The Pledge of Allegience, National Anthem, and Invocation opened the event. 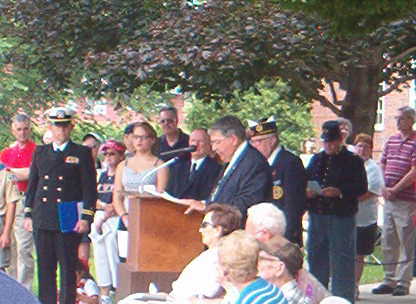 Mayor Keller, pictured at the podium above, presented "Nazareth Remembers" and was followed by local historian James Wright who presented a History of the 153rd PA Volunteer Infantry Regiment. 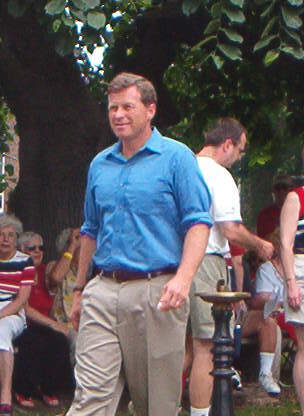 State Representative Richard Grucela (on the right in the picture to the left) rededicated the Cannon and Congressman Charlie Dent (pictured to the right) was in attendance as well. 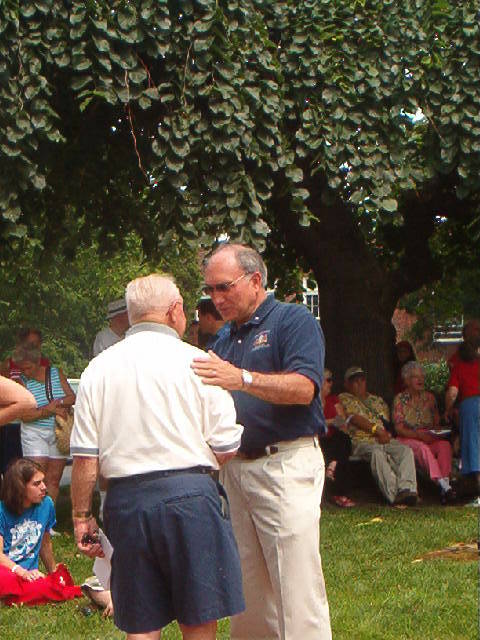 There was also a reading of the Gettysburg Address, Placement of a Wreath, the singing of the Battle Hymn of the Republic, an Honor Guard Volley, and Taps. The program ended with a Benedication and the event was held in memory of Councilman Kim Kromer. All in all Mayor Keller put on a wonderful event. To read the article about the event in the Morning Call click here. Being a native of Nazareth growing up there in the 30s and 40s I am glad to see the cannon back in the circle along with the iron fence again and the other improvements. Now I read about all the feuding going on about a new police station. Seems to me it should remain at least on Belvidere St. It just would not seem to fit in on Center st. Course my opinion does not matter but I give to you anyway.